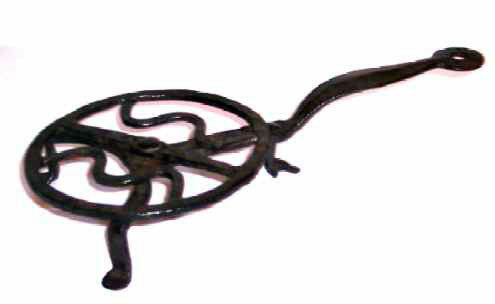 This very exceptional miniature revolving broiler of hand-wrought iron is rare in both size and design. Note the two penny feet and the third, more whimsical, ladies boot. The arched "lollipop handle is a nice decorative detail that speaks to the art of the blacksmith. He has taken a utilitarian item in which function defines form and turned it into Folk Art. The ultimate test of a true artist is in his ability to capture the essence of an object which is its life, to freeze it in time and then release it when someone looks at it 100 years later. Sometimes defined as the uncommon art of the common people, Folk Art refers to the trappings of everyday life decoys, weathervanes, quilts, hooked rugs, etc. infused with a spirit that transcends their original practical purpose. Most Folk Art, by its very nature, is anonymous. It is the work of people, not names. However, we do know a bit more about the maker because about 1" from the boot toward the axis of rotation, the piece is signed "J*K". Wisdom says this mini broiler is actually a trivet! In fact, out of a group of about 100 trivets shown in the Treasury of American Design, only two examples are mini broilers! This little cutie measures 10" long with a 4-3/4" diameter on the revolving plate. It is in exceptional condition.